Nothing wrong with my current Pinhead wheel locks, but while I'm in the process of upgrading some components on my bike, why not look around and see what else can be replaced? 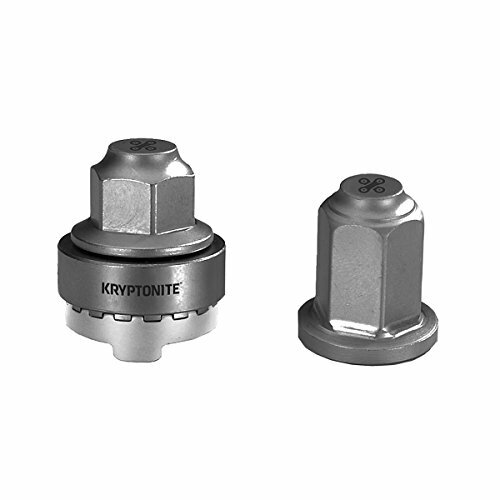 Maybe these Kryptonite Gravity WheelNutz are a good idea? These wheel locks are unique in that they use gravity as the locking mechanism. When the bike is right side up, the nuts can be tightened, but never loosened. And if you're bike is properly locked, flipping your bike over to loosen the lock is virtually impossible. I like this mainly because it means I don't have to carry an additional Pinhead "key" with me at all times. The Pinhead key is big and bulky and clunky. It'd be nice to just use a standard sized tool to unlock the bike -- as long as I can flip the bike over.